Stock or big valve versions. 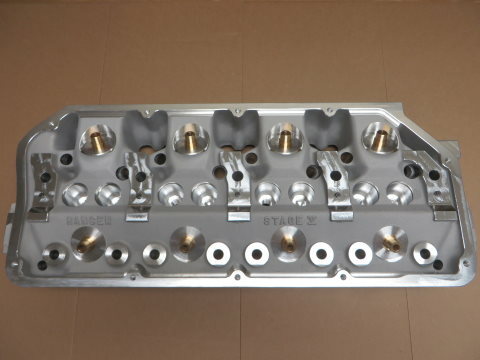 Standard 16-bolt or vertical 6-bolt or 10-bolt GM style intake manifold pattern configuration, or 16 & 6 or GM & 6 patterns. Stock low exh port or raised exh port. Head bolt sizes 7/16" stock, 1/2", or 9/16". Single or Dual spark plug versions. For supercharged engines stainless steel exh guides and chrome-moly int guides are recommended. Copper alloy valve seats available. These are the ultimate in water cooled Hemi cylinder head technology. Made from a superior grade of aluminum C355-T6 which is 21% stronger than 356 commonly used by other manufacturers. The Stage V hemi head was developed under the rigors of Top Fuel racing for years and proven to survive several seasons at 6,000 Hp levels. Doubtful if any other hemi head manufactured today would even survive a burn-out. Despite having numerous strength/design advantages, with the factory look, Stage V heads can still be mistaken for the original iron version. Some of the other hemi heads currently produced look so little like the original, you might as well just install a chevy engine. The standard valve angle head can be offered with smaller port sizes for increased velocities for normally aspirated engines. The big valve size "kicked valve" version is usually for large-CID or supercharged engines requiring massive port sizes. The heads have a wide variety of options such as the GM style intake bolt pattern which lends itself to fabricated manifolds. A "Half-Solid" version can be ordered for extreme power configurations or external water ends for twin-turbo endurance. An option of a "Smooth-End" setup for Custom Rods where you can have the dependability of a 426 and the "clean-looks" of a 392 early model. If you are building a Hemi for Street-use, Bonneville, blown fuel boat drag racing, Pro Mod or virtually any application where water cooling is required the Stage V head has the most potential for your success. In fact, a set of these heads were on the "King of Speed" Al Teague's Speed-O-Motive Bonneville streamliner when it set the FIA world record for top speed by a wheel-driven vehicle 409-plus m.p.h. average with a 433 m.p.h. exit speed. That is full power for seven miles!